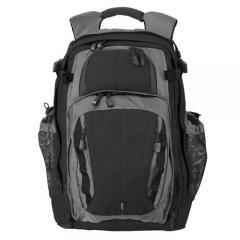 511 Tactical COVRT 18 Backpack (56961) FREE SHIPPING! The 5.11 Tactical COVRT 18 backpack is a lightweight pack that protects and transports your firearm and other equipment discreetly. It features a concealed Rolldown Assault Compartment with web platform and a hidden ambidextrous BBS weapons pocket, and is compatible with the Back-up Belt System and future QuickTact accessories. It also contains a padded computer sleeve with a hook-and-loop retention strap and multiple internal and external organizer pouches. The pack is made from tough water-resistant nylon, and features YKK zippers and Duraflex hardware. The adjustable shoulder straps include QuickTact accessory straps for additional versatility, and the bag also comes with a sternum strap and a sturdy carry handle for additional portability. ©2002-2019 CopsPlus.com: 511 Tactical COVRT 18 Backpack (56961) FREE SHIPPING!